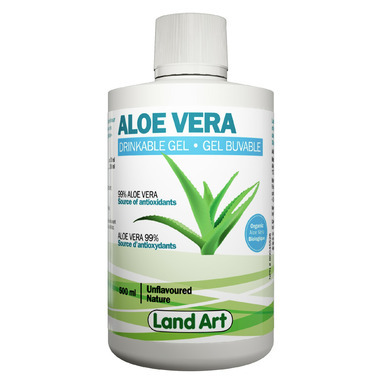 Land Art’s Aloe Vera Gel provides a superior intake of polysaccharides. Each portion of 60 ml contains 99.7% of pure Aloe Vera (providing 60 mg polysaccharides). This 99% pure organic source gel does not contain sugar or glycerol. Aloe vera is rich in amino acids, digestive enzymes, minerals and vitamins. Land Art Aloe Vera Gel contains no dairy, wheat, gluten, yeast or corn. This 99% pure gel is also free of sugar and glycerol. This drinkable gel is cranberry flavoured. Directions: Take 1 to 2 tablespoon (15 to 30 ml) as is or mix it in a juice or a smoothie. Refrigerate after opening. Ingredients:Ingredients: Aloe Vera gel (purified water, concentrated organic aloe vera juice OTCO certified, xanthan gum), citric acid, ascorbic acid (vitamin C), potassium sorbate, sodium benzoate. * Contains no dairy, wheat, gluten, yeast or corn. Tastes horrible.Different people tried it and they all said the same thing.It taste the way herbicide smells. Couldn't use it.